The TWA ceramic rotary valves are designed from the outset to be reconditioned to "as new" with changeable wear parts. These valves are installed under electrostatic precipitators handling fly ash at a coal powered power station run by RWE in Niederaussem, Germany. There are 36 valves and 12 spares, transferring ash from the ESP outlets into a Claudius Peters Fluidcon pneumatic conveying line. The ash is extremely abrasive as the power station burns brown coal with a high level of sand content. 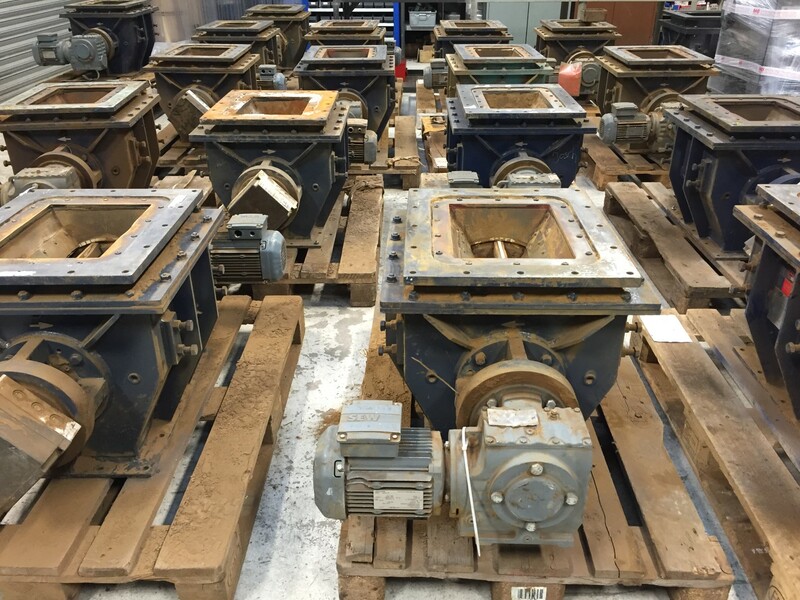 Normal rotary valves, even tungsten carbide coated units, lasted only 6 weeks before being completely worn out. The TWA ceramic units last 12-18 months and are then returned to MID for complete overhaul and reconditioning to as new. The cost savings in downtime alone are enormous and with no adjustment required on the units as they have mechanical shaft seals, the daily maintenance has also been drastically reduced. These valves will be stripped, cleaned, and rebuilt using new ceramic tiles ready for reinstallation for another duty cycle.